Zoodle Pad Thai Salad is a refreshing low carb version of the beloved Thai street food, made with spiralized zucchini. Heat the oil in a wok and saute the garlic, ginger and jalapeno for several minutes, stirring constantly. Push them to one side and add the eggs. Scramble them, breaking them up as they cook. Whisk together the sauce ingredients and add to the pan. Heat until it comes to a boil, and then add the tofu, scallions, water chestnuts, bean sprouts, and zoodles. Stir fry for a minute or so, tossing everything really well to distribute the sauce evenly and just barely soften the zoodles. Toss in the cilantro and take off the heat. Serve hot right away, or remove from the pan and refrigerate to serve chilled as a salad. 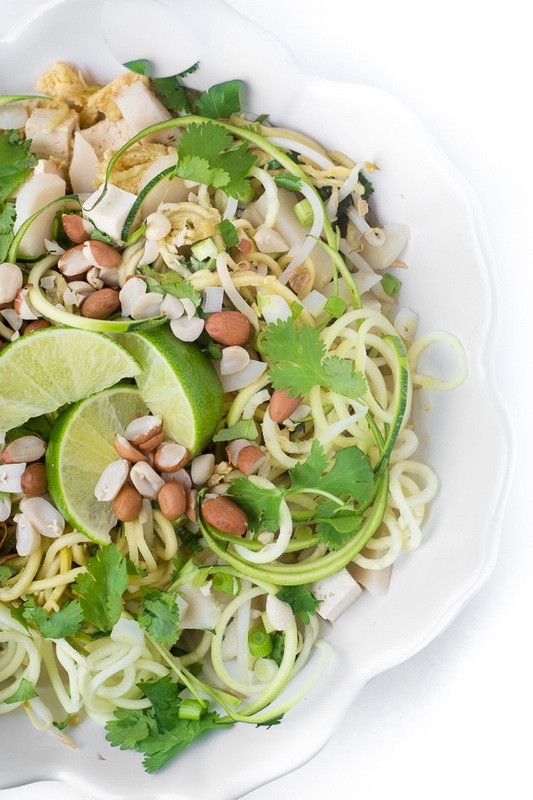 Garnish with lime wedges, chopped peanuts, and fresh cilantro. Homemade Pizza in less than an hour!